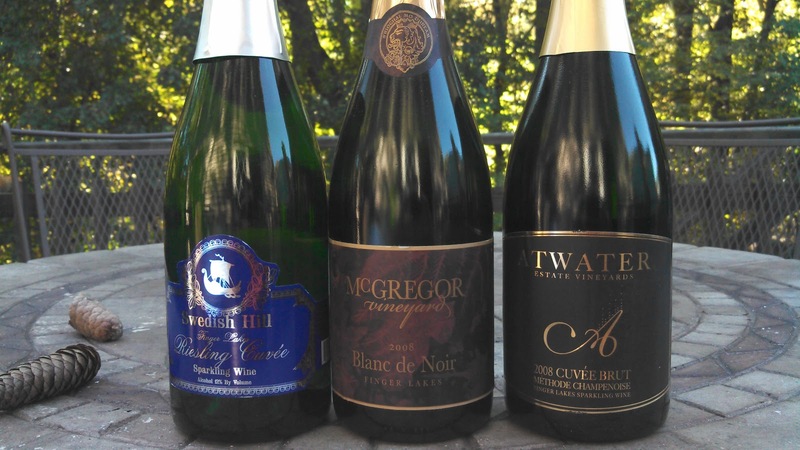 With Friday October 26th being the 3rd Annual #ChampagneDay 2012, I thought it wise to draft a compendium of the sparkling wines from around the world. First, what is sparkling wine? Basically, it is still wine augmented with significant levels of carbon dioxide - thus the bubbles or fizz. Sparkling wine can be produced using one of two methods: (1) still wines undergo a second fermentation (in the bottle or in a sealed vat) or (2) CO2 is directly injected into the bottled still wine. The traditional method (méthode champenoise) involves a second fermentation in the bottle where sugar and yeast are added to the bottle, triggering a second fermentation. "Through the process of riddling and eventually disgorgement, the dead yeast cells (lees) are removed from the wine while still maintaining the dissolved carbon dioxide gas." The Charmat method is the other secondary fermentation method which occurs in pressurized stainless steel fermentation tanks. The fresh yeast and sugar mixture is added to the wine in these tanks - basically an economies of size solution to the méthode champenoise. After secondary fermentation the wine is cooled, clarified and bottled using a counter pressure filler. Champagne - is produced in the Champagne region of France using the méthode champenoise and most likely Chardonnay, Pinot Noir, and Pinot Meunier grapes. Chardonnay is prized for its finesse and aging ability. Pinot Noir adds body and fruit while Pinot Meunier contributes substantially to the aroma, adding fruit and floral notes. The majority of Champagnes produced are non-vintage (or rather, multi-vintage) blends. Crémant - is sparkling wine produced using méthode champenoise in seven French appellations and one in Luxenbourg. In France, Crémant wines must be hand harvested within fixed yields and the resulting sparkling wine must be aged at least one year. In Luxenbourg, Crémant is produced in the Moselle district using the traditional method followed by at least nine months of aging. Crémant d'Alsace - produced from Pinot Blanc grapes, but may also contain Pinot Gris, Riesling, Pinot Noir and Chardonnay grapes. Crémant de Bourgogne - produced in Burgundy and must be composed of at least thirty percent Pinot Noir, Chardonnay, Pinot Blanc or Pinot Gris grapes. Crémant de Die - produced in the Rhône Valley region using Clairette, Aligote and Muscat grapes. Crémant du Jura - produced in the Jura wine region, located between Burgundy and Switzerland. White and rosé wines can be produced from Poulsard, Trousseau and Pinot Noir red grapes and Chardonnay, Pinot Gris and Savagnin white grapes. Crémant de Limoux - produced in the Languedoc region, specifically in the villages surrounding Limoux and composed primarily of Mauzac (Blanquette de Limoux). Crémant de Loire - second largest producer of sparkling wine in France usually using a blend of Chardonnay, Chenin Blanc and Cabernet Franc. Crémant de Luxembourg - produced in the Moselle district using the traditional method followed by at least nine months of aging. Cava - Spanish sparkling wine produced primarily around Catalonia. According to Spanish law, cava may be produced in eight wine regions: Aragon, the Basque Country, Castile and León, Catalonia, Extremadura, Navarra, Rioja or the Valencian Community. Cava can be white or rosé (small quantities of Cabernet Sauvignon, Garnacha or Monastrell are added). Traditionally Cava is produced from indigenous Macabeu, Parellada, and Xarello grapes but may also contain Chardonnay, Pinot Noir and Subirat. Prosecco - Italian sparkling wine made using the Charmat method and primarily Glera grapes harvested from Veneto and Friuli Venezia Giulia. Asti - Italian sparkling wine that is produced in southeastern Piedmont, particularly around the towns of Asti and Alba. The wine is made from the Moscato Bianco grape using the Charmat method and is generally sweet and low in alcohol. Lambrusco - Italian sparkling wine produced using the Charmat method in four zones in Emilia-Romagna and one in Lombardy using six Lambrusco red varieties: Lambrusco Grasparossa, Lambrusco Maestri, Lambrusco Marani, Lambrusco Montericco, Lambrusco Salamino and Lambrusco Sorbara. All of these various Lambrusco grapes are indigenous to Emilia and neither clones nor sub-clones. Franciacorta - Italian sparkling wine from Lombardy using a blend of Chardonnay, Pinot Noir, Pinot Blanc and using the méthode champenoise. Sekt - German or Austrian sparkling wine produced usually using the Charmat method. Deutescher Sekt is produced exclusively from German grown grapes (Riesling, Pinot Blanc, Pinot Gris and Pinot Noir), whereas most Sekt is produced from imported grapes.In Austria, Sekt is produced from Welschriesling and Gruner Vetliner grapes. Espumante - Portuguese sparkling wine produced throughout Portugal from the northern region of Vinho Verde to the southern region of the Alentejo. Quality Espumante is produced solely in DOC Bairrada, located just south of Vinho Verde, using the méthode champenoise and made from quick-pressed red Baga or Touriga Nacional grapes, fragrant white Maria Gomes, Arinto, Bical and Chardonnay. Pezsgő - Hungarian sparkling wine produced primarily using the Charmat method, but more recently the méthode champenoise using indigenous Olaszrizling, Kékfrankos, Furmint, Királyleányka, Hárslevelű, Kéknyelű and Juhfark or Chardonnay, Pinot Noir, Riesling, and Muscat Ottonel. 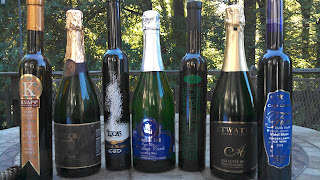 Penina - Slovenian sparkling wine made using the using the méthode champenoise usually from the Radgona-Kapela district (Drava Valley) or Bizeljsko-Brežice district ( Lower Sava Valley). Australia - sparkling wine in Australia is usually made from Champagne grapes using the méthode champenoise with Tasmania and Victoria the most prized regions. Sparkling Shiraz is made from oak aged Syrah that undergoes secondary fermentation using méthode champenoise. United Kingdom - sparkling wine is produced in the U.K. in Kent and Sussex counties using the méthode champenoise and from multiple grapes Seyval Blanc, Kerner, Müller-Thurgau; and to a lesser extent the Champagne grapes: Chardonnay, Pinot Noir and Pinot Meunier. 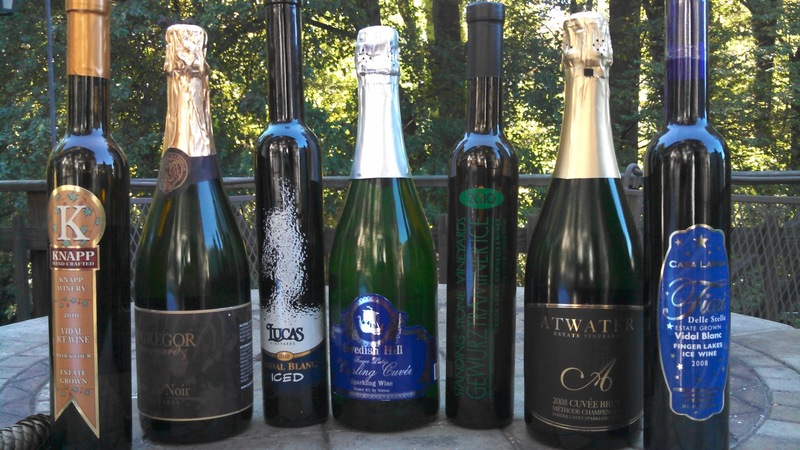 South Africa - South African sparkling wine is called Method Cap Classique, South Africa’s name for methode champenoise using traditional Champagne grape varieties. United States: most American wineries produce sparkling wines using the methode champenoise and traditional Champagne grape varieties. Finger Lakes - cooler climate allows for more intense flavors at a lower brix measurement using Chardonnay, Pinot Noir and Riesling grapes. This week we participated in a Finger Lakes Wine Country Finger Lakes Wine Virtual Tasting Series tasting on Dessert, Sparkling, & Ice Wines. We were sent samples from seven Finger Lakes wineries - specifically three sparkling wines and four dessert or ice wines.during the tasting several bloggers shared their insight on the wines via Twitter (#FLXWineVT), submitted questions to the winemakers, and watched real time as the winemakers discussed their wines. 66% Pinot Noir and 34% Chardonnay blend. The grapes ripened at the same time, which allowed them to be co-fermented after being whole clustered pressed. The winery then follows the traditional Champagne Methodoise where the the wine undergoes a secondary fermentation in the bottle with active riddling so that the lees do not settle in one area. The lees are removed during disgorging, more sugar and wine added during dosage, and then sealed with a champagne-style cork closure. The result is an impressive sparkling wines - full of green apple flavor, a strong mid-palette, and a refreshing lemon finish. 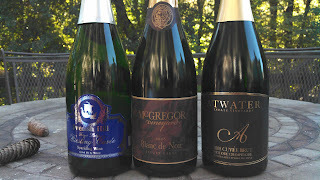 We moved next to the 100% Pinot Noir 2008 Blanc de Noir ($30) from McGregor Vineyard Winery. This wine was created because winemaker Jeff Dencenburg wanted to experiment with a 100% PN. My feelings is that the wine is just not on par, particularly when following the Atwater Cuvee. Yes this wine had a decent mouth feel, but the flavor was bland and not exciting. Many of the other bloggers disagreed, proving that no two palettes are the same. 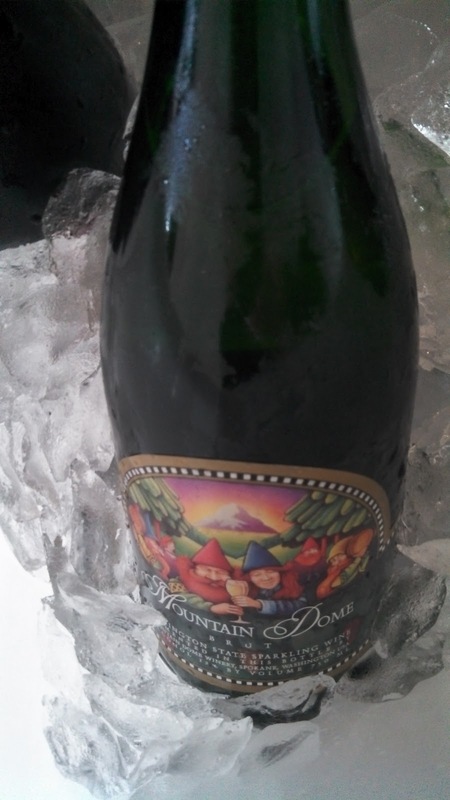 The final sparkling wine was the Swedish Hill Winery Riesling Cuvee ($18) - a most interesting wine fermented to 3.5% R.S. and reminding many of us as a Proseco - with more flavor. 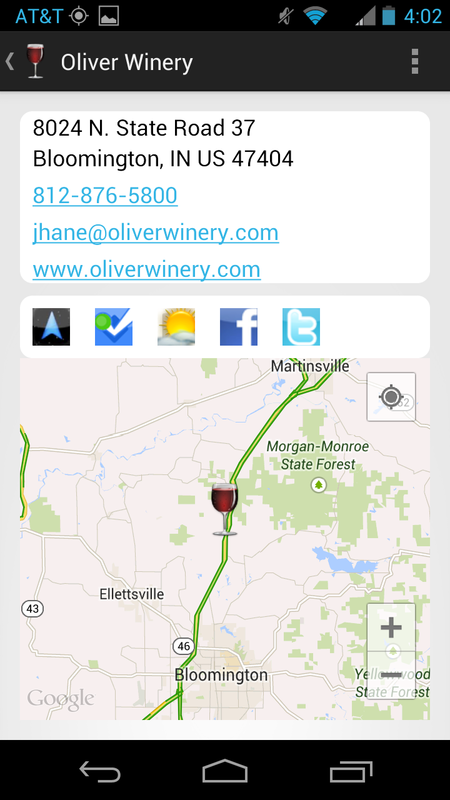 The Riesling juice was tank fermented in order to retain the inherent flavor of the grape. The result is a food friendly sparkler with a strong amount of lychee on the nose and a nice balance between sugar and acidity at the tail. Nicely done. Round two consisted of the dessert and ice wines and these were all well received. 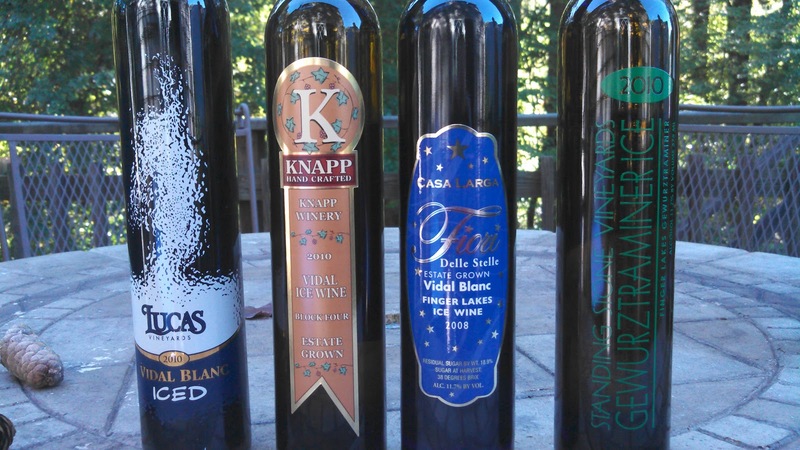 We started with the Casa Larga Vineyards 2008 Fiori Vidal Blanc Ice Wine ($45). The name translates to Flower of Stars in Italian and is what the harvest workers view in the dead of night when harvesting the frozen grapes. Yes, true German style Eiswein are produced from grapes harvested when completely frozen in the middle of night - usually in late December or early January. As expected, the volume at harvest is much lower than for grapes harvested on a normal schedule resulting in 1/4 less yield (1 ton of grapes = 160 gallons vs 1 ton of grapes = 40 gallons). The Eiswein juice is then cold fermented and the result is a slightly syrupy sweet nectar. And the beauty of using Vidal Blanc is the natural acidity and the grape balances the concentrated sugar in the wine. The is a very nice apricot flavored wine - perfectly balanced between sweetness and acidity. 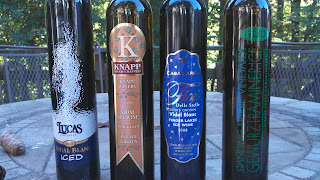 The other true "Eiswein" was the Knapp Vineyards Winery 2010 Vidal Ice Wine ($25). The was my preferred dessert wine of the evening showcasing an orange aroma, followed by a full - full apricot profile, finishing with refreshing acidity. This reminded of the famed Hungarian Tokaji wines - with a high puttonyos. And at $25 a bargain. 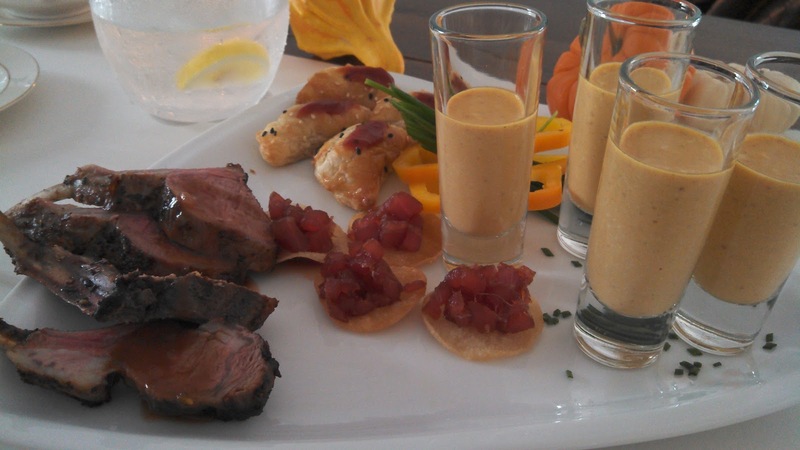 The last two wines were produced in an ice wine style where the grapes were harvested late and then immediately frozen in order to concentrate the sugars. The Lucas Vineyards 2010 Vidal Blanc Iced ($25) was very similar to the Knapp, without the orange aroma, but a very similar apricot flavor profile. Just a tad lighter - but a very nice wine. The Standing Stone Vineyards 2010 Gewurztraminer Ice ($25) is an excellent alternative to the Vidal, emanating a more lychee flavor profile with a spicy finish. Gewurztraminer is an interesting grape to use for an ice styled wine since its low level of acids would be difficult to balance the concentrated sugar. Yet freezing the grapes solves this problem by concentrating the acids in addition to the sugar. The result is a balanced wine. Cheers to the Finger Lakes - there's more than just Riesling. 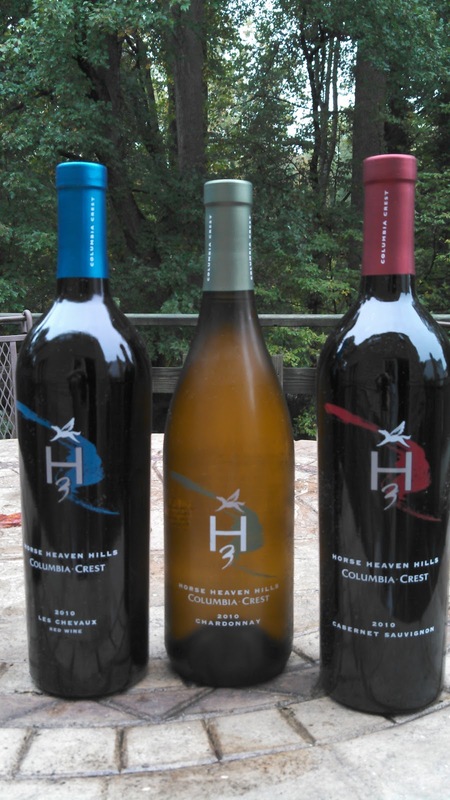 We were invited to participate in the monthly #TGTaste with Leslie Sbrocco featuring wines from the Columbia Crest Winery H3 brand - specifically three wines from Washington State's Horse Heaven Hills AVA. This area is located in south-eastern Washington and is surrounded by the Columbia Valley AVA and Yakima Valley AVA to the North and the Columbia River to the South. It is responsible for 25% of grapes harvested in the Evergreen state and 100% of the grapes in the wines we received. Winemaker Juan Munoz Oca explains that this AVA gives whites more minerality and reds more cocoa, earth and dust notes. 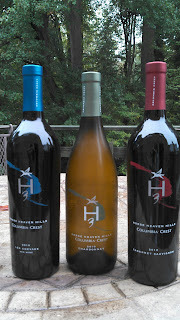 The second wine was the Columbia Crest 2010 Horse Heaven Hills Cabernet Sauvignon ($15) , 97% cab of pure enjoyment. It's medium bodied which oozes cherries with a velvety mid-palette, and a smooth, soft finish - very little tannins. What an easy drinking wine - and this one came with those cocoa notes. But what about the other 3%? According to Oca, the 1% Cabernet Franc provides herbal notes to the nose and adds layers of fruit and depth. Not bad for a 1 percent-er. And the 2% Merlot provides some backbone & structure. The final wine was the Columbia Crest 2010 Horse Heaven Hills Les Chevaux Red ($15) - a Merlot dominant blend augmented with Cabernet Sauvignon & Syrah. Named in honor of the AVA, "the Horses" is also a smooth cherry flavored wine with more acidity than the Cabernet Sauvignon as well as a slight tobacco. This seemed to be the #TGTaste favorite - this writer excluded. Cheers to Columbia Crest and H3. This week I was graciously invited to the Northwest Expressions - a #WAWine Food and Wine Experience hosted by Josh Wade from the Nectar Wine Bar as well as Visit Spokane. 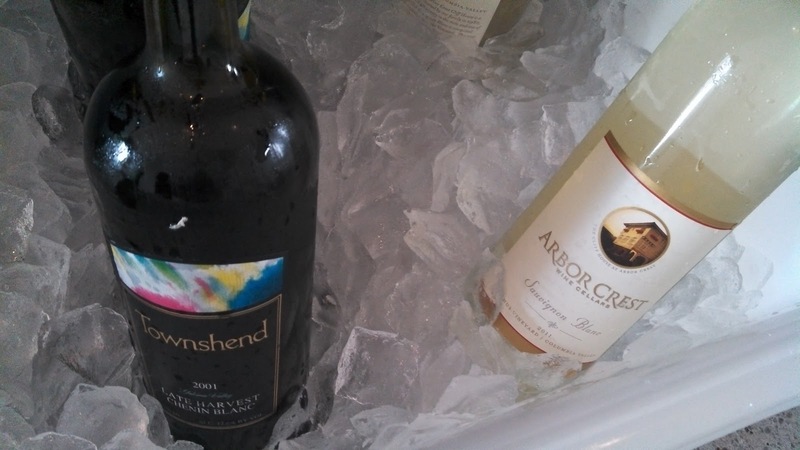 The luncheon featured five wines from the Spokane region paired with food catered by Geppetto Catering, Inc. 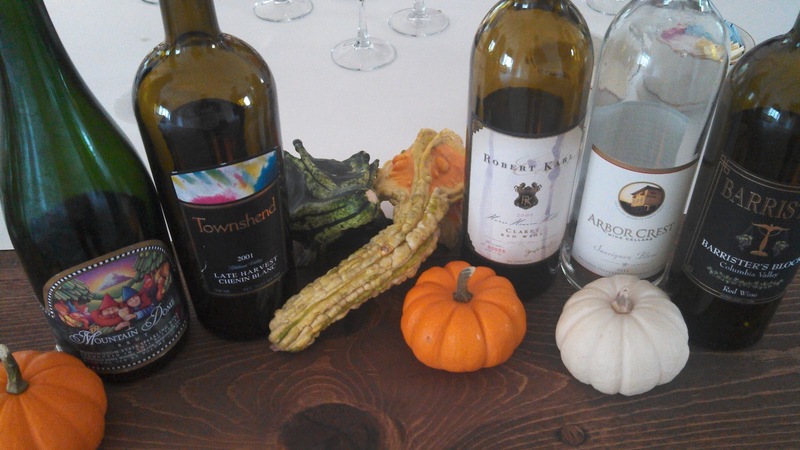 There are just over 20 wineries located around Spokane, with many operating tasting bars downtown. Whereas some grapes used by Spokane are wineries are sourced from other AVAs, we learned how challenging the Sokane environment is for estate vineyards - particularly their early frost and late Spring. In fact, the region encountered it's first frost of the season two nights ago - whereas here in Virginia - harvest continues for some varieties like Cabernet Franc. And being only 15 or so miles from the Idaho border, the Spokane region probably has more in common with the Snake River Valley AVA then other Washington state AVAs. We also learned that Spokane is home to Washington's first post-Prohibition distillery - Dry Fly Distilling - that's reason enough to plan a visit. We started our tasting with the Arbor Crest Wine Cellars 2011 Bacchus Vineyard Columbia Valley Sauvignon Blanc paired with an assortment of appetizers - seconds were ordered for the Rabbit Empanadas. Apparently Arbor Crest with their Cliff House Estate is a popular tourist attraction, particularly in the Spring when over 20 thousand tulips bloom. The winery is also one of the oldest in the Evergreen state (the 29th) and has been producing Sauvignon Blanc from the very beginning. The 2011 Bacchus Vineyard is an excellent value ($10) for a lemon-citrus wine with sweet sensations followed by a tart and acidic lemon finish - without the grassy flavor of New Zealand. 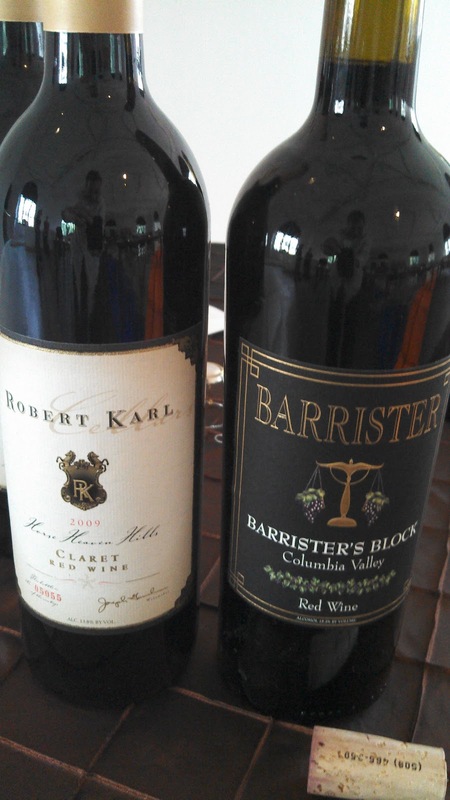 Next up was the Barrister Winery Barrister's Block Red, a non-vintage blend of four grape varieties (70% Cabernet Sauvignon, 15% Syrah, and 5% each Merlot, Cabernet Franc and Malbec) from three separate vineyards ( Pepper Bridge, Seven Hills and Bacchus). This was my favorite wine of luncheon, pepper in the nose and tail; but a silky creamy mid-palette that was quite savory. This was also the most expensive wine in the tasting - $32. Josh served the Mountain Dome Winery Brut as a palette cleanser for the main course and this wine proved that affordable and tasty sparklers are available in Spokane. The wine is made méthode champenoise and consists of 70% Pinot Noir and 30% Chardonnay. 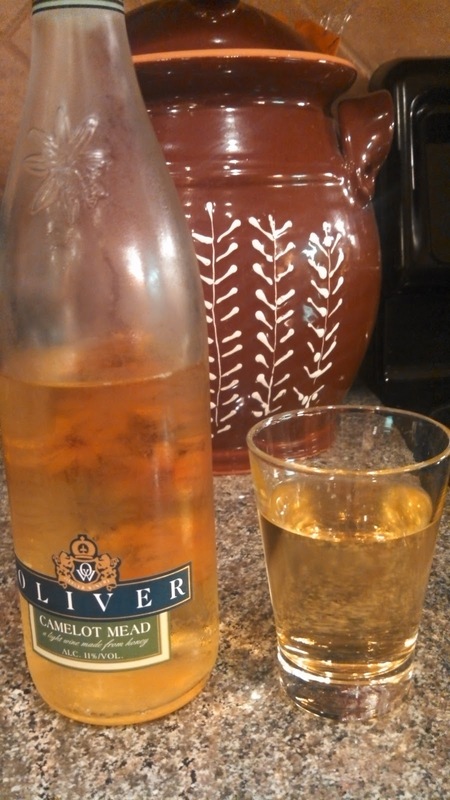 It is a clean refreshing wine with subtle green apple flavors. Quite tasty - and priced between $15-$18 - a bargain. The main course included roasted herb chicken and wild Atlantic Salmon cakes, so we broke etiquette and consumed the Robert Karl Cellars 2009 Horse Heaven Hills Claret ($20). The winery loves to hold wine back in the bottle to allow it to mature and this is no exception. This wine exudes cherries, from front to back, with an interesting leather character. 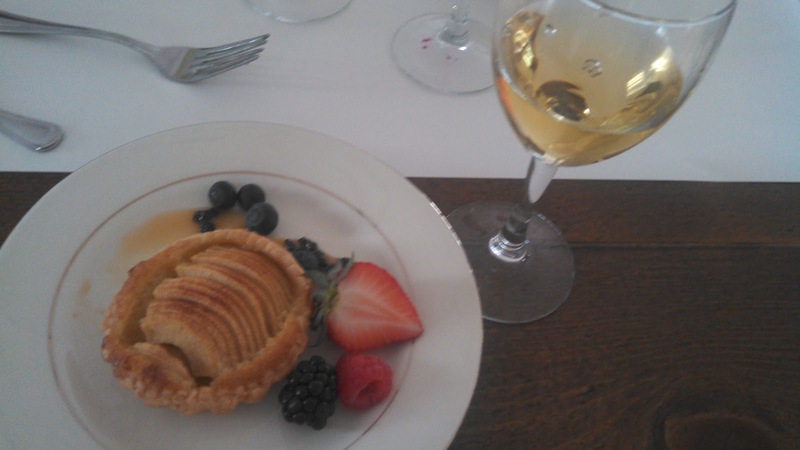 We finished lunch with the Townshend Cellar Late Harvest Chenin Blanc and an apple tart with Josh explaining that the wine must be sweeter than the dessert. At 12%RS, this is a sweet wine - reminiscent of some Tokaji wines - with apricot flavor predominant. Wonder if dry Chenin Blanc and Furmint are similar? In any case, this was a splendid finale for the lunch - great to spend time with old friends and finally able to meet Josh and the Visit Spokane folks. Hope to share a meal with them again on their side of the country - perhaps in the Spring - we all love Tulips. Prior to Prohibition, Indiana was the 10th largest wine producer in the states, largely due to the vibrant wine industry centered around Vevay. A century earlier, John James Dufour, a Swiss immigrant, had planted a a hybrid labrusca grape, Cape, in the vicinity of present day town of Vevay. The grape flourished and soon after “Vevay" wine was sold to the remainder of the country. After Prohibition, the decimated Hoosier wine industry was resurrected with the help of the world's oldest fermented beverage: Mead. Remnants of this libation has been found in Chinese pottery vessels dated 7,000 BC and later in diverse areas as Egypt and northern Europe. A truly global beverage. In the early 1960's Indiana University law professor William Oliver started making wine in his basement. He established a vineyard northwest of Bloomington and with abundant harvest explored opening a commercial venture. He assisted in steering the 1971 Indiana Small Winery Act through the Indiana State Legislature and opened Oliver Winery to the public the following year. Ever since, their best seller has been the Camelot Mead, a lighter bodied mead, but off-dry with a considerable honey finish. This is an excellent Mead - one that I can consume by the full glass; not just small doses as a dessert wine. It is lighter then most, with no syrupy texture and is made from my favorite honey - Orange Blossom. And at $9 - well worth the price from the Grateful Red in Arlington Virginia. Cheers.